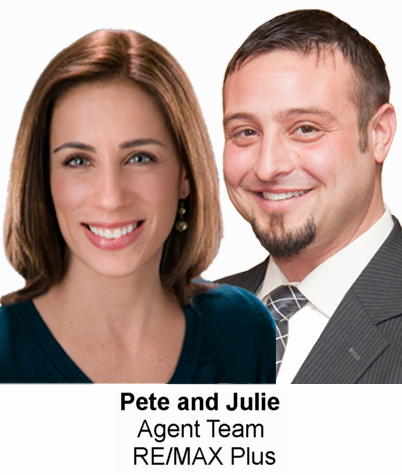 Pete is a licensed broker and full-time Realtor® with over 10 years of experience helping sellers, and Julie is a highly lauded, top producing buyer's agent. With their diverse strengths, it only made sense that Pete and Julie joined forces to create an unstoppable New York agent team. From a single office that opened in 1973 in Denver, Colorado, RE/MAX has grown into a global real estate network with more than 100,000 Sales Associates. Those agents constitute the world's most productive real estate sales force. Pete bought his first investment property over 10 years ago - and since then, has dealt with multiple property rehab projects. With a background in renovation, Pete really understands the investor's point of view in a real estate transaction. He's now been a full-time agent for over 10 years and has held his broker's license since 2007. Pete loves helping people find their perfect home. Pete also used his expertise to develop an innovative, easy to use open house app for agents. Click here to learn more about The Open House Toolkit. Julie has always had an interest in real estate, and after her first son was born, she wanted to find a career path that was flexible but also allowed her room to grow and build her business. Real estate was the perfect fit. As a buyer's agent, Julie prides herself on offering superior client services and consistent communication. Her main goal is to make every real estate transaction as stress free and seamless as possible. By working as a team to represent both sides of the real estate equation, Pete and Julie are able to offer a level of service that most individual agents would struggle to keep up with. The pair has been working together for 3 years and have found success by supporting each other and each other’s clients, staying current with trends and events and keeping up with their own education. Both Pete and Julie work hard to establish relationships that will extend far beyond closing by making sure they are consistently exceeding their clients' expectations. Pete and Julie use the Zillow Premier Agent program for lead generation and ongoing agent advertising. By investing in target zip codes, the pair regularly generates a good number of buyer and seller leads. As they realized how many new leads were coming into their pipeline, efficient lead management, quick follow-up and intelligent nurturing quickly became a major focus. That's when Pete and Julie heard about Zurple. After doing a little research, they realized that it was the perfect complement to their Zillow marketing program. Pete has been very active on Zillow for 5 years and leverages its capabilities to the fullest, including video, featured lender’s listing and Premier Agent program. His goal is to appeal to younger buyers and he has focused on being easily searchable online thanks to his active presence on Facebook, Twitter, his own website and his optimized Zillow profile with nearly 50 client reviews - a setup that brings in lots of new business. Both Pete and Julie find their team business model to be very effective and productive. Pete takes care of seller leads while Julie actively engages with buyers leads and oversees all the paperwork. After establishing an efficient business model, it was time to find an effective CRM. Pete wanted something that would help generating new business and keep himself and Julie in front of their leads and existing customers. Zurple, which seamlessly integrated with their Zillow lead generation efforts, proved to be the perfect match. Pete and Julie are beyond pleased by the fast-followup and ongoing nurturing that Conversations™ provides. Supplementing their marketing strategy with an intelligent, data-driven, automated system gives them the freedom to quickly grow their business.